Finether always and will always provide best service for our dear customers. Send us email anytime if you have any questions or problems, we will reply within 24 hours. 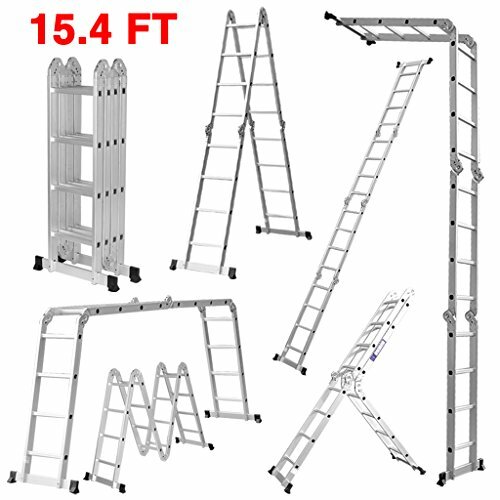 This multi-purpose extendable aluminum folding ladder is great for attic, library, warehouse, supermarket, above-ground pool, bunk bed, apartment fire ladder escape, trampoline, manual work, fruit picking, loading and unloading truck, home/building maintenance, window washing, car washing, exterior/interior decorating, painting and more. Dimension: Fully extended length: 470cm / 15.4ft; Fully folded height: 123cm / 4ft; Folded dimension: L14. 2 x W10.6 x H48.4 inches; Extension dimension: L36 x W27 x H123 inches. Safety First: Safety locking hinges. Certificated to European Safety Standard EN131. Lightweight: Extra thick all-rustproof aluminum alloy construction, weight only 29.1lbs (13.2kg). Multi Purpose: Can be used as single ladder, double sided ladder, trestle, work platform, stair ladder etc. Easy to Storage: Folding extension ladder, easy to carry and easy to storage. Weight Capacity: 330lb (150kg) capacity. If you have any questions about this product by Finether, contact us by completing and submitting the form below. If you are looking for a specif part number, please include it with your message.